We have had the pleasure of working with many amazing professionals in the industry. Here are some of our very favorites! DePoy Studios offers couples raw, urban, and stylish wedding photography in the Phoenix and Chandler areas. They are not another run-of-the-mill Phoenix wedding photographer. Every wedding is treated with the utmost care, professionalism, and creativity that you may not find with other photographers. Edgy, Raw, Modern, Stylist, Badass; these are some words past couples use to describe our style. DePoy Studios is proud to bring the type of Phoenix wedding photography that couples are dying to have, show off, and display on their walls. Guitarist and composer Alex Hristov blends traditional Flamenco and modern world music with a variety of Latin American forms into a unique style inspired by both the Old World and the New. Alex specializes in music for private & corporate events, weddings, resorts, and casinos. His repertoire includes: traditional Flamenco, Nuevo Flamenco, Latin, Brazilian, and Classical, mixed with Top 40 favorites. His vibrant sets ebb and flow with racing rumbas, beautiful boleros, soaring sambas, and a touch of southern Spain. He can perform solo guitar as well as enhance his performance with custom created backing tracks arranged meticulously in his studio. Alex has created memorable musical experiences for hundreds of wedding ceremonies, rehearsal dinners, cocktail parties, private residences, and corporate events over the last seven years. It would be his pleasure to provide the exquisite musical canvas your next event deserves. Beauty & Brains Productions is an International Powerhouse of creativity & talent. They specialize in Eco-Friendly Event Production, as well as High-Drama Candle Design & Décor. Offering their clients unique and boutique Staging, Rental & Retail options, their designs & packages are completely customizable & they enjoy working with all types of clients, the world over. Over 25 years ago, a woman from New York decided the entertainment available in Arizona could use a boost. She started Showstoppers Interactive Entertainment and it was wildly popular! Beginning with Bar and Batmitzvahs, Showstoppers became a house hold name for all sorts of social events. Word of mouth spread quickly and very soon, corporate groups were hiring Showstoppers to entertain at many of their events. Whether you need aerialist, dancers, singers or interactive entertainment take a moment and check out this cool crew. Amii & Andy are a wife and husband team of Arizona Wedding Photographers who own Sunshine & Reign Photography. They are based out of Phoenix, AZ, and serve all of Arizona and the United States. They also welcome adventures worldwide, and are available for commission to travel to international destinations. Amii & Andy love telling couples’ love stories through wedding photography and describe their style as modern and artistic. They are artists and are highly skilled at using prisms and other techniques to create images that can best be described as rad! Their style combines artistic portraiture with an ability to capture intimate and spontaneous moments as a photojournalist might (it’s all kinda digital, vintage-mod in their world). Snapbooth Entertainment started with you in mind. Being a recent bride and groom ourselves, we want to ensure that your day or event is as stress free as possible. Let Snapbooth entertain your guests. One of the greatest parts about having a photo booth at an event is that your guests walk into the booth and with a push of a button it takes 4 pictures of them. They take the photo strip home as a keepsake from your special day. Your guests will be talking about the photo booth for years to come and it will be the highlight of any event. Kelly + Sergio’s mission is to create bold, emotion-driven images for quirky couples with attitude. Kelly + Sergio photograph each couple like they would photograph a member of their own family. They give soul to each wedding by photographing what it feels like. In 2012 Sergio was named one of the Top Ten Wedding Photographers in the World by American Photo Magazine. This is one of the biggest honors that can be accomplished in wedding photography, it’s comparable to an actor winning a Grammy. Sergio was honored to not only win the award, but to have his photo on the cover of the magazine as well! 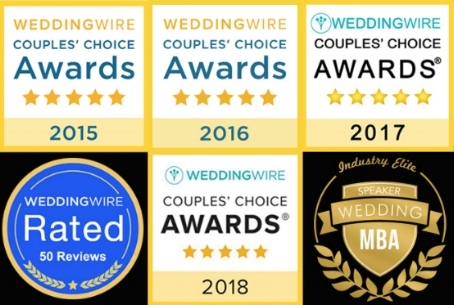 We believe that every film, just like every single one of our couples, is unique and should be treated with a one-of-a-kind experience. Each film is a chance to tell a story unlike the one before it and we do this by focusing our cinematic and documentarian expertise on the people that surround the event. Started by Devin Berko, Something New Media (© 2013) began as a philosophy for his clients to combine the best talent in filmmaking with couples that want the most cinematic portrayals of their day. "This is the world's finest ice cream, it is called gelato," replied the attendant with a smile on his face. Little did we know that the word "gelato" would become such a big part of our lives... Started in Tucson... Frost is as "cool" as it gets! Want to swank out your event with a little flavor... Bring in Frost. They will add that extra touch by bringing in hand made flavors of gelato, for your guests to enjoy, customized to your vision! Couple of Bartenders is a fully insured and TIPS Certified professional bartending company, but come on; don’t kid yourself – WE ARE A MOBILE BARTENDING COMPANY!!!! We love to have fun and bring good times to those around us with great cocktails and top notch service. Couple of Bartenders has been spreading those good times all across Arizona for all types of occasions specializing in: weddings, private parties, corporate functions, fundraisers, charity organizations, or just about any other reason you can think of. Our Liquid Caterers look forward to serving you and your guests at your next event!